Randy Feere Photo Jared Pancoast competing at the Broncs and Honky Tonks Spring Indoor Rodeo on Saturday. 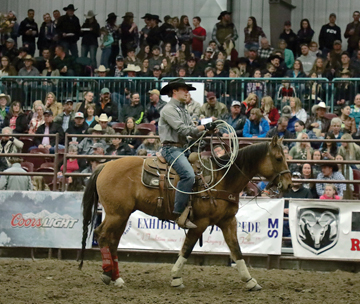 Medicine Hat’s annual Broncs and Honky Tonks Spring Rodeo was held last weekend and is a kick off for many riders to their rodeo circuit season. Cypress County team roper Jared Pancoast says the first rodeo on his adopted home turf to begin the season is always exciting. “If a person can have some luck at the very first one, it gets the ball rolling and a lot of the time you wait all year to try and get the ball rolling,” said Pancoast. However, the indoor scene provides a different atmosphere to that of the traditional outdoor arena. “It’s really different being indoors,” he said. Pancoast considered himself to be a late bloomer as he did not start roping until he was 11 years old after growing up playing hockey and other sports before putting a sole focus into rodeo. “I roped around here most of the time. My family wasn’t really involved in rodeo,” he said. He credits his brother getting to know cowboys that really peaked his passion for the sport. “They had a high school rodeo program that he started attending and (I’d) go and watch and see what they were doing,” he said. Pancoast says to compete at a higher level of team roping a rider has to have a good set of horses underneath them. “Just lately I got mounted a lot better on better horses and I spent my whole life making my own horses and starting from scratch,” he said. When he is not in the arena, he is a stock contractor and produces team ropings for his JP Productions business. “I supply cattle at ropings all across southern Alberta, some in Saskatchewan,” he said. Pancoast says “Team roping in Canada has absolutely grown and it’s amazing how fast it’s growing.